We love traveling by train. There is something so romantic and old-worldly about it, something that makes you want to put on a great dress and order a martini even if the bar car only offers luke-warm coffee (yes, looking at you, Deutsche Bahn!). For years I had to take a train to go to school as a teenager and still it hasn’t deterred me from being absolutely enamored with trains. If there is a train to take, I will choose it over any other mode of transport. To me the best thing of taking a train is that journey truly becomes part of the destination, it is not just another mode of transport. Sweeping landscapes passing by, an instant connection with other travelers and knowing that regardless of how basic or fancy a train is you will get a truly local experience. Especially after my recent journey through India, I am more enamored with train travel than ever before. With that, I started my personal train bucket list. Follow me aboard to the most epic train journeys around the world! The Trans-Siberian Railroad is a legendary and one-of-a-kind train route. No other route has such a claim to fame. For those who want to travel in style, I recommend a trip on the Tsar’s Gold private train. Sit back in the comfort of your cabin and enjoy views of the most stunning scenery while exploring highlights of Russia, Mongolia, and China for 16 days. The journey becomes part of the destination aboard the Tsar’s Gold. 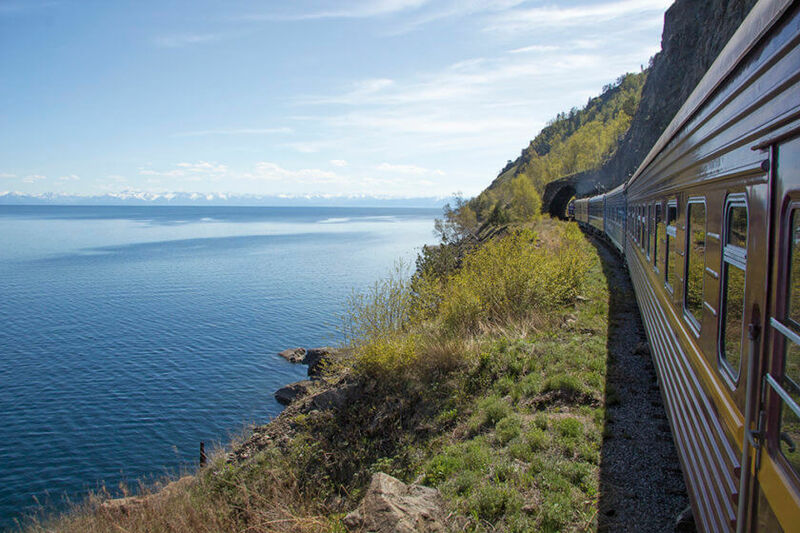 Highlights include the normally closed original route of the Trans-Siberian along the majestic shore of Lake Baikal. On your way, you will discover Moscow, Russia’s capital, and its iconic sights, traditional Siberian villages straight out of a fairy tale, and the nomadic culture of Mongolia. 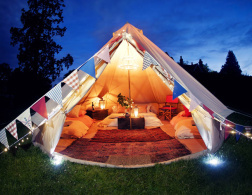 Experience the mini-Naadam, a festival with archery, horse riding, and wrestling before spending the night in a traditional yurt in the Mongolian Alps. The journey ends in Beijing where you have the chance to explore the Great Wall of China, the Forbidden City, and the Temple of Heaven. Best of all? A journey on the Tsar’s Gold allows for ultimate comfort: cabins are for 2 – 4 people (personally, we love the look of the Nostalgic Comfort cabins! ), and there are onboard shower facilities and a dining car offering local specialties depending on the area you are traveling through. 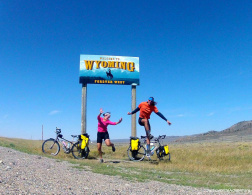 You can check out dates, itineraries, and prices here. 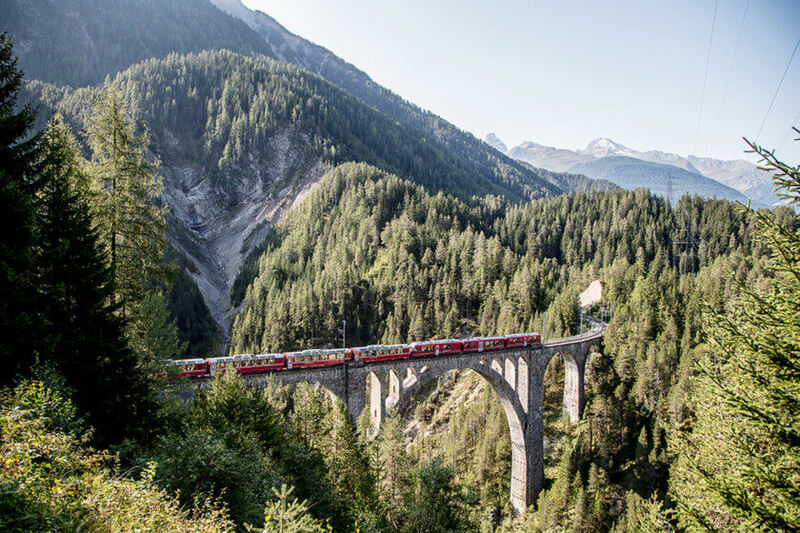 A very special train is the Bernina Express which is the third train to become a UNESCO heritage train, being called “universal outstanding”. The route is over a hundred years old and is a masterpiece of innovation while immersing itself into the beautiful landscape, bridging the gap between nature and technology. The journey starts in Thusis and travels through the Alps including famous St. Moritz all the way to Mediterranean Tirano. No other train covers such a diverse landscape in such a short amount of time. In less than five hours you can see glaciers and palm trees as well as 55 tunnels and 196 bridges. Luckily the Bernina Express is a panorama train with windows to match so you won’t miss any of it. Impressively, the train even makes it up to 2253m to Ospizio Bernina without being a cog railway! Enroute, you will travel through small villages with historic and cultural sites in addition to those beautiful Alpine views. Perfect for those who are interested in culture as well as nature, connecting north and south, and experiencing Swiss hospitality and Italian ‘la dolce vita’. Another legend amongst the most beautiful trains is of course the Venice Simplon-Orient-Express. Even today a trip aboard recreates the magic of the golden age of travel since you are traveling in one of the original 1920s carriages. 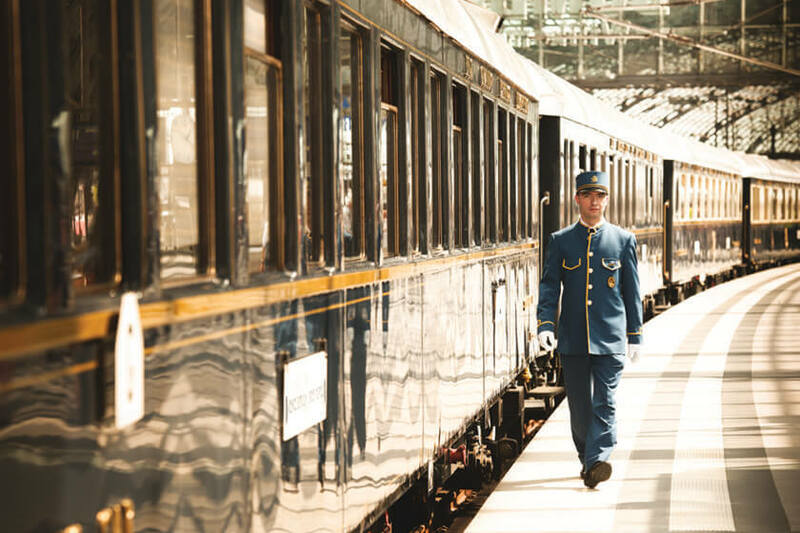 The Venice Simplon-Orient-Express travels through continental Europe, the highlight being the classic route to and from London and Venice via Paris. On the various trips, you will have beautiful views of the Alps and across the Venetian lagoon, the Rhine Gorge or even Budapest and Bucharest. Depending on the length of your journey you will get to explore some beautiful European gems, spending nights on- and offboard the Orient-Express. The latest route takes you from Paris to Berlin through the UNESCO heritage site between Bingen and Koblenz as well as passing some of Berlin’s most famous sights. Onboard you will be entertained with a jazz band playing 1920s music, evoking a Berlin cabaret. Definitely, pack a dress and some heels for this trip because even the ‘regular’ dinners are a lavish affair. After all, the Orient-Express comes with three dining cars and a bar car including a grand piano and a resident pianist. Keen to get into the mood? Definitely watch these movies before. 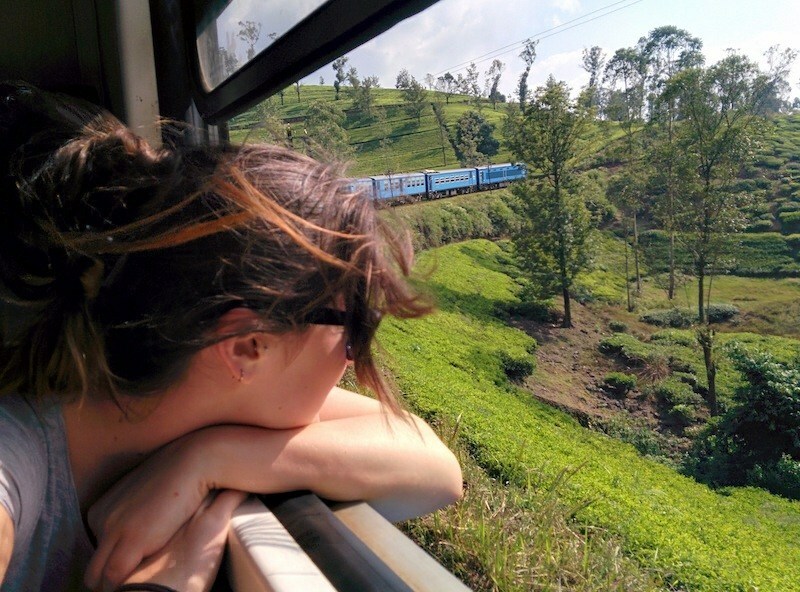 Often described as one of the world’s most scenic train rides this one is also one of the cheapest – all aboard the train from Kandy to Ella in Sri Lanka! It is one of the most famous must do’s in Sri Lanka, after all, train travel is the way to go in here especially when you are trailing through the beautiful hill country. Albeit not always the most comfortable, the scenic views on this route make up for it. Remember all these bloggers hanging out of open train tours, wearing cute little dresses and smiling at the sweeping landscape? Yes, these pictures were most likely taken on board of one of these trains. In Sri Lanka, you usually have a choice between 1st, 2nd and 3rd class with prices ranging from $2,60 to $9. Some can be booked in advance and for that, I recommend using a booking agent. While an airconned first class ticket for such little money may sound tempting, you won’t see much of the landscape – windows will be closed after all. So I recommend one of the cheaper seats in the other classes for epic window views. If you can’t get a seat (reserving one might be an issue) you can always become one of the girls hanging out the doors. Don’t forget your selfie stick and watch your head! If you are keen to break up the six-hour long journey, stop at Nuwara Eliya or any of the other picturesque stops to explore some tea plantations and soak up the views of Sri Lanka’s beautiful hill country. 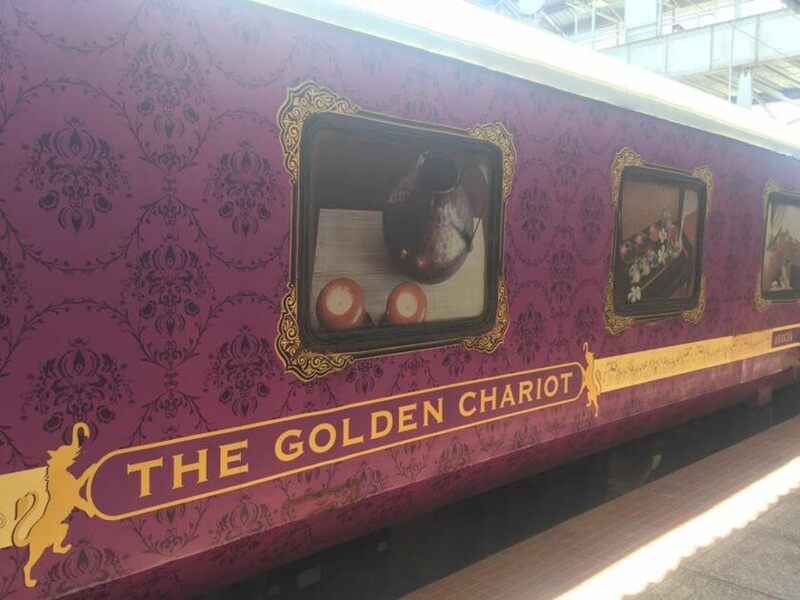 The Golden Chariot is one of the only luxury trains traveling through the South of India. It is hard to miss as it exterior is bright purple and usually attracts a lot of attention when pulling into the station. It offers two different routes through Southern India. “The Pride of the South” takes you through Karnataka with one day in Goa and highlights like stops in Mysore and Hampi, departing and arriving in Bangalore. The other option is the “Southern Splendour” covering Kerala and Tamil Nadu. The train operates on a set schedule depending on the season and just like a cruise ship you can get off for excursions every day while traveling at night. All excursions are included in the price and usually include bus transfer as well as a local tour guide and entrance fees. While the Golden Chariot is considered a luxury train and has little in common with regular Indian trains and their overstuffed cars and shared bunks, it is definitely an affordable luxury option. You can choose between twin and double cabins spread out over 19 cars. In addition, it not only has two restaurants, serving Indian and Western cuisine, but a bar and even a spa and a small gym. Perfect to work off all the delicious Indian food you will eat – this isn’t your average train fare after all. For those who are worried about eating food on trains or Indian food in general, fear not – there is a medic on board. Our resident Scotland Travelette Kathi advised me on this one: a journey on the Jacobite Steam Train also loveling referred to as the Hogwarts Express here. I was immediately convinced (and apparently I am not the only one) that the journey from Fort William to Mallaig is one of the most scenic train journeys in Britain. You don’t even need to be a Potterhead to appreciate the views though it was definitely the movie’s claim to fame that put the Jacobite Steam Train on the ‘to-do’ list of the public. 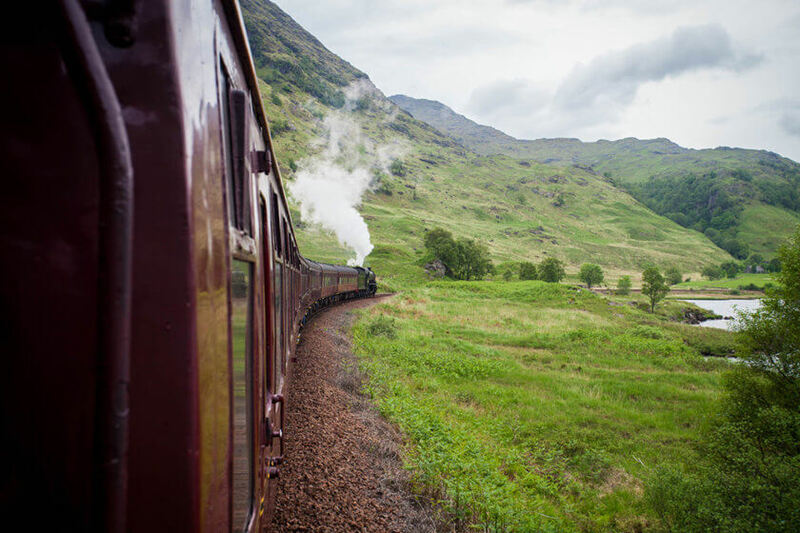 The scenery is everchanging and stunning as you wave your way through hills, passing lochs and small stations – you may as well be traveling in a different century. To get the best views and shots make sure to get a seat on the left when traveling to Mallaig – this will give you the best angle for an epic picture when crossing the iconic Glenfinnan Viaduct. If you want more than this one shot it is worth getting off and hiking up the hill behind the Viaduct. From here you can get an epic photo of the entire train while it is crossing over. And yes, fear not, Potterheads – dressing up is quite common for the Hogwarts Express. Just leave your owl at home! If you don’t have a wand yet you can get one at the Harry Potter fan shop on board. 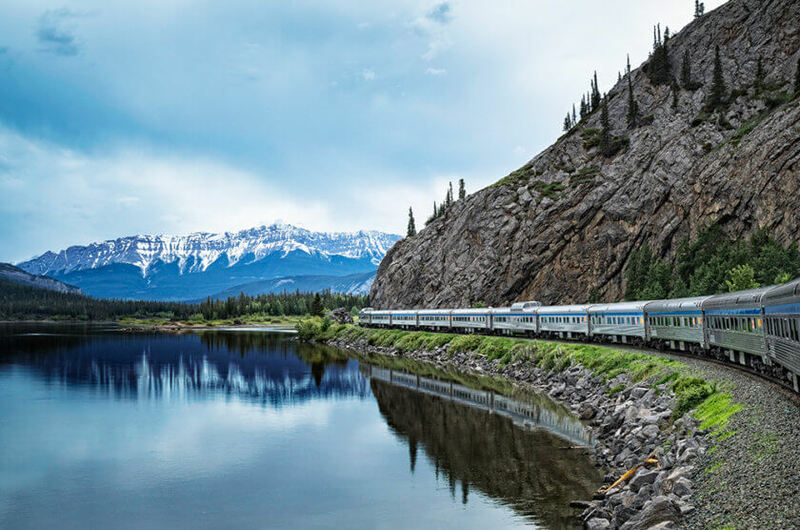 Over four days you will travel through the stunning landscape from the Pacific to the Canadian Rockies – luckily you have Skyline and Panorama cars to soak up all the views on board the Canadian. This train has been traveling through cities, villages and remote parts of Canada since 1955 spanning almost 4,500 km. From coastal towns to snowy mountains and everything in between, you can cover with a trip on the Canadian. Trains depart from Toronto or Vancouver and have various stops on the way. The five main stops include Winnipeg, Edmonton, and Jasper in addition to Toronto and Vancouver. While the stunning landscape is definitely the show stopper of this train journey, life on board is not too bad either. Depending on your budget you can choose between a comfortable economy class with lounging seats, various options for a sleeper class or the fancy prestige class. The latter is a five-star hotel on rails with luxury cabins including private bathrooms and personalized concierge service. What all classes have in common is access to those panorama cars where you can enjoy the views. After all, seeing the Rockies AND the Pacific should be a highlight for everyone onboard. Have you been on an epic train journey? Which of these trips would you choose? 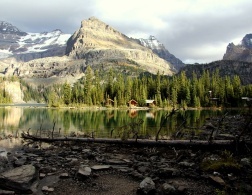 Is this the Perfect Hike in the Canadian Rockies? Just wow blog. I love travelling and your blog presentation is awesome. Thanks for sharing. I see I have a lot of catching up to do when it comes to train journeys! I tried to go to India this year but that didn't work out. Beautiful train journeys, though, thanks for the inspiration! I took trains all across India, but they were nothing like these! I would love to go back and do it again but on The Golden Chariot. Trains are such a beautiful way to understand a country and see all types of people living there. I also LOVE to travel by train! Just like you write, it becomes an enjoyable part of the journey instead of just being a bothersome mode of transportation. You get to see more of the country you travel through and it's also so much more sustainable which is simply great! Really wonderful collection of epic train Journey's, the one I found best was Venice Simplon-Orient-Express will eagerly waiting to visit this place and enjoy the breath taking views. Thanks for sharing this collection.